I would guess the majority of dentists go into the profession for this primary reason: to help make a difference in people’s lives by providing exceptional dental care. It’s noble and admirable. For almost 20 years, Dr. Lisk has been doing just that – providing exceptional, comprehensive dental care to his patients. I caught up with Dr. Lisk to ask him how he chose dentistry, what he enjoys most, and where he sees the future of dentistry – along with a few quirky questions to get to know him better. Q: When you were a kid what did you want to be when you grew up? A: A Veterinarian. Specifically, a zoo vet. Q: What was your first entrepreneurial experience as a kid? Q: How did you become interested in dentistry? A: It was the summer between my freshmen and sophomore year at NC State and I was having my wisdom teeth removed. The dentist performing the procedure asked me if I would be interested in coming to shadow him for a day. I did and recall liking it very much. It was at that moment that I swapped a goal of Vet School with Dental School and the rest is history. A: Hmmm. I’ve been rather fortunate and haven’t had any bad bosses per se. One rather important lesson I learned early on, however, was at my high school job working at Chick-Fil-A. I learned the importance of working together as a team. It takes a team of people working in harmony to have a successful business and that comes from good leadership. Q: Who has been your greatest inspiration? 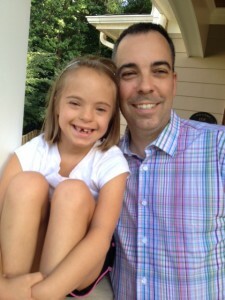 A: Without a doubt, my greatest inspiration is my daughter Maddie. Even though she is only 10 years old, she enjoys life more than anyone I’ve ever met. Maddie has Down Syndrome which makes some aspects of life more challenging for her – speech being her greatest challenge – but she always remains optimistic, genuinely happy and triumphant over any perceived disability. She brings out the best in people and has never met anyone that she hasn’t liked. She makes this world a better place and I know the sky is the limit for her. Q: If you had to choose one thing, what do you think you’re the best at? A: Wow, that’s a hard one. I’d have to say I’m a good listener. I really try to listen to patients concerns, respond to their needs and make them feel comfortable. Q: What does a day-in-the-life of Dr. Lisk consist of? A: I usually wake up fairly early and begin my day with a coconut milk protein smoothie. I arrive at work early each day to greet my wonderful staff where we have a morning huddle to discuss the schedule and specific treatment plans. We always end our meeting with a team member reading a positive or inspirational quote to encourage us to be the best versions of ourselves and provide the finest service to our patients. I see patients most of the day while helping patients achieve optimal dental health. After work I usually hang out with my children by either playing with them or carpooling them to their respective sports or activities followed up by eating dinner as a family, which is very important to my wife and I. In the evening I can usually be found watching sports or reading. Q: What do you think is the most important innovation of your lifetime thus far? A: From a professional standpoint, I’d say dental implants. From an overall perspective, probably the Internet. Q: What ignited the spark in you to become an entrepreneur? A: As I child I always felt being your own business owner would give you more stability and independence. Q: What makes you different from other dentists? A: We pride ourselves on creating a more personalized approach to dentistry. We are dedicated to offering patients skilled care and making them feel comfortable from the moment they arrive at our practice. For many patients, visiting the dentist is not something they look forward to, and our team works hard to make the dental experience relaxed and welcoming. Our waiting room is more like a living room and our treatment rooms are comfortable and inviting. And, most importantly, we treat each patient as part of our family. Q: What kind of culture exists in your dental office? How did you establish this tone and why did you institute this particular type of culture? A: I think our office is easygoing, kind-hearted and cheerful. We have a very relaxed, friendly culture where we treat people as individuals and people and not just as employees. Being in a dental office, patients can already be tense and apprehensive when they come in. I believe if they walk into an atmosphere that is already relaxed, it will go a long way in helping them maintain their finest oral health. Q: Besides money, what are your favorite ways to compensate people? A: Hmmm. I tend to give people gift cards to their favorite places because it’s more personable then just cash. I try to pay attention to what my employees like, where they shop, what kinds of things would brighten their day other than a generic gift. I also like to introduce people to my favorite places with gift cards – especially to “Mom and Pop shops” because I’m in favor of supporting small, local businesses. Q: Where do you see the future of dentistry headed? A: I would be most excited about tooth regeneration. I’m hopeful for rapid scientific and technological advancements to provide more information and solutions that would make regeneration of teeth a routine treatment option. Q: If you could be anything other than a dentist, what would it be? A: Probably something with sports – an agent, coach or broadcaster. Q: How is running a successful business different than what you thought it would be? A: Initially, I thought running a successful business was just about being good at a skill or trade. In reality, it’s about strong personal relationships with employees, clients and, for me, patients. Q: What three pieces of advice would you give to college students who want to become a dentist? A: First, take as many business classes as you can. Second, before you even begin dental school, visit all the different specialties of dentistry to identify areas of interest or narrow your focus. Lastly, make sure that you are a people person! Q: If you had to battle a giant, what weapon would you use? A: A light saber, of course. Q: Would you rather be liked or respected? A: Hmm…I think be liked sounds more superficial. Being respected allows you to leave a legacy. Q: Describe the color yellow to someone who is blind. A: Ha ha! OK. Bright, cheery, sunny, awakening, lively.